There are a couple of things that Maria Hinojosa and I share in common: First, we’re strong Latina journalists who aren’t afraid to use our voice, and second, we’re both 5-feet tall. 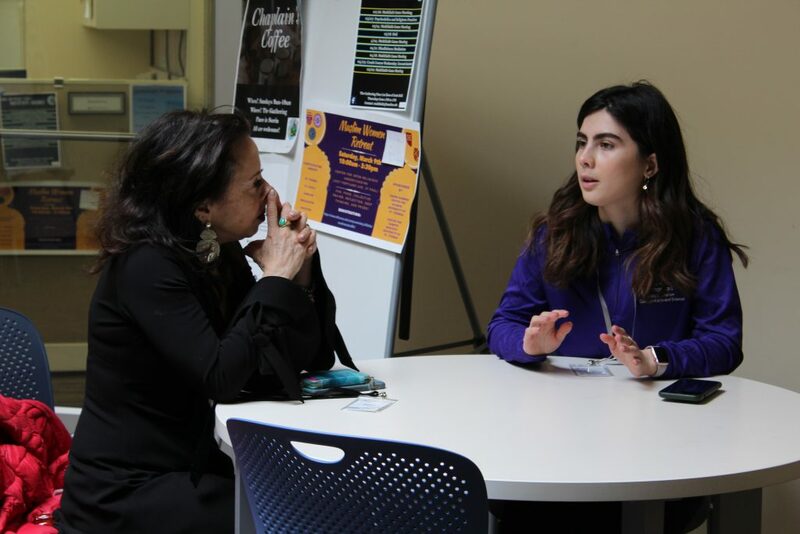 Keynote speaker Maria Hinojosa speaks with ThreeSixty reporter Kelly Saybe. Hinojosa opened day two of the Truth and Transformation: Changing Racial Narratives in Media conference as the keynote speaker at Hamline University on Wednesday, March 20. Hinojosa wishes newsrooms looked like the diversity of bodies at the conference, present and conscious about the troubling biases and inaccuracies in journalism. The conference attendees varied wide from media professionals, media consumers, and students like me seeking to speak the truth and understand absent narratives via ThreeSixty journalism. “If you do not diversify your audience, your audience will disappear,” Hinojosa said. Hinojosa is a renowned Mexican-American journalist who’s reported for a diversity of media outlets including CBS, PBS CNN, NPR, NBC, MSNBC and CBS Radio. Hinojosa’s belief in the power of journalism brought her to create and launch a multimedia, community-based journalism program called “Futuro Media Group” in 2010. The journalism nonprofit aims to give a voice to those who are absent in the narrative of today’s traditional media. 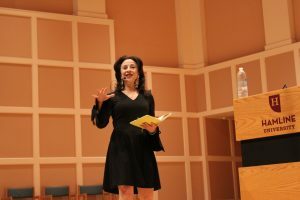 Maria Hinojosa delivered the keynote at the second day of the Truth and Transformation: Changing Racial Narratives in Media conference at Hamline University. Hinojosa is now the anchor and executive producer of the NPR show called “Latino USA” that “informs many individuals about the growth of one of the largest groups in the United States,” Hinojosa said. I was inspired and moved by Hinojosa’s keynote, as she owned the space as she held her hand-written speech in her Moleskin journal. As a Latina, I resonated with her words about the trouble we find in journalism still today. At times, journalists will report and share stories without the full representation of a community they find themselves in. Sometimes these communities are the ones that I find myself in. Hinojosa said it isn’t that hard to find the people who are being represented in those stories, because it is the duty of a journalist to tell the truth. Hinojosa discussed the linguistic evolution needed in journalism, and shared there are certain words she will not use and has banned from her newsroom. The list includes illegal, minority, slave and interment. She believes these words strip human beings of their dignity, while sugarcoating and concealing the distressing realities that the world endures. In journalism it is important “we own our terms,” Hinojosa said. Journalism isn’t just a profession for Hinojosa, it’s a mission. When I got the chance to interview Hinojosa, I felt honored and slightly star-struck to ask my burning questions. Immediately I felt a bond with Hinojosa, and I felt that I could share pieces of my life that have pieced me as a Latina journalist and student. 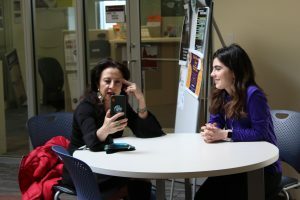 Maria Hinojosa records a video message for Kelly Saybe’s mom, telling her she doesn’t have to worry about her daughter. Hinojosa is truly a superwoman; her self-care habits involve boxing and mediation to stay sane in a profession that requires her 24/7 presence. No wonder she can do a million things at once to guide her mission on telling and equipping others with the tools to own their voice. It’s not often that I am able to speak Spanish with a journalist or see and speak with a journalist that looks like me. In fact, Hinojosa is the first journalist I have ever interviewed and shared common roots with. This ability to speak Spanish allowed me to share my own story as an immigrant and DACA student. Despite these barriers, Hinojosa understood and expressed empathy and words of encouragement on my current situation. Hinojosa’s tough reporting has brought her to shed light on the current opposing forces acting against DACA students, immigrants, refugees and people of color. She continues to question the actions of the current government and administration. Hinojosa has traveled down to the U.S-Southern border seeing families torn apart, just like how she was almost ripped apart from the arms of her mother when she came to the U.S. as a child. She told the audience it was a light-bulb moment when she realized she could have been the child in the cage, an image seared into our minds from coverage of recent deportations. Hinojosa allowed me to share my own voice, my story, and fostered my hope that journalists like her are changing and transforming newsrooms and journalism. Hinojosa hopes to see more young journalists, to push through mainstream media fully conscious and committed to sharing the stories of complex and diverse communities. The bond with Hinojosa is unlike any bond I have ever shared with a journalist and leader. After the interview, we had a conversation, and Hinojosa offered to call my mom. Speaking in Spanish, Hinojosa told my mother I am an amazing woman. She told my mother how strong she is to have made the right choice risking her life for a better one and to not worry so much in this chaotic traffic of time. When I shared the video with my mom, tears started to roll down her face. We laughed together, and she told me it was amazing to see a woman who looked like her encouraging a woman like me to be powerful, present and own her roots and voice. Gracias, Maria, for empowering young Latina women like me to not shy away from using our voice to encourage others and authentically share beautiful stories. The takeaway from the Truth and Transformation conference is for journalists to keep systems and media sources in check when they report stories on people of color. My experience as a ThreeSixty journalist, defined my role and mission to report and be an ally for my friends and neighbors who are often not represented accurately in the media. The conference called for authentic narratives, because there is no media without ME.